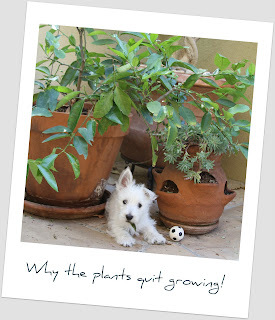 The White Dog Blog: Gonna be doing some gardening! Well it's a wonder I've survived this long! They have been trying to kill me! I have been here for WEEKS now and they finally looked up poisonous plants. Practically everything on our patio could kill me! Dad's reaction: "If it makes him sick he will quit eating it." Looks like we're going all roses this weekend!